Back to Basics Tip #17: I’m counting this as a Back to Basics Tip and my Friday’s 5 at 5. Since it’s Education Week and we are learning the basics and fundamentals of sewing, I thought I would give you some tips to help you. And we will be continuing Sewing 101 Education Week along with our regular stuff (tutorials, Project 52: Date Nights, etc.) next week. As I got into Sewing 101 Education Week, I found a lot more posts to write and teach you. So just bare with me if you’re not into sewing. But I will have a tutorial on Monday that is simple enough for beginners and cute enough for everyone. Trust me. You’ll want to come back next week. Read your manual. How boring. I know. But really. You can learn so much about sewing and how to work your machine by going through the manual. It will tell you what each stitch is used for. What additional equipment you will need. How to make a button hole or attach a button. How to clean your machine. Troubleshooting. And if you have a used or hand-me-down sewing machine (like mine) look for a manual online. Look for the manufacturing plate at the back of your machine and it will tell you the brand, model number and maybe even the year it was made. Look at the manufacture’s website and you can find manuals there. Or call the 1-800 number for the company asking for a manual. They can mail it to you for a small fee or email you a free PDF copy. I found mine online. Pre-wash fabric. You don’t want to sew something then wash it later to find it fitting differently or not at all because the fabric shrunk or whatever. It’s important that you do this for any fashion fabric that you used for clothing. The exception would be home decor fabric that you use to make drapes or covering chairs and the such. The type of fabric that is dry clean only. To find out how to treat certain fabric, read this Back to Basics Tip #3. 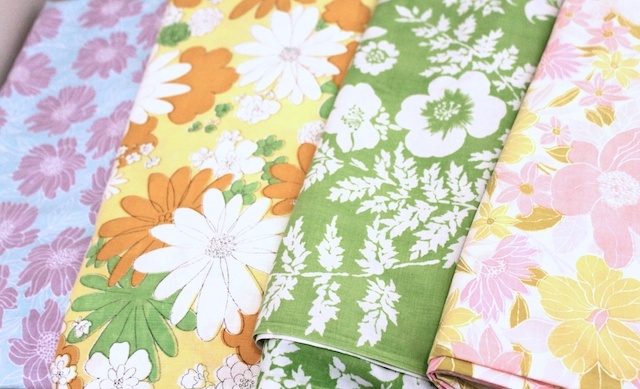 Determine a straight edge when working with patterned fabrics. You don’t want the patterns to be crooked or slightly tilted, unless it was on purpose. And when they cut the fabric in the stores, it’s never a straight line at the cut. To find the straight line, make a slight cut at the cross grain (the side where the store cut the fabric) then tear the fabric. The fabric will tear straight. Iron seams and edges. This will help you in sewing and make it look for finished and professional. So keep the iron and ironing board close by, you’ll be using it a lot. Find fabric in thrift stores. My favorite place to shop for fabric is thrift stores. You can find specialty fabric there. Or even better, I love reusing bed sheets (flat or fitted) as fabric for my projects. You get 3 yards or more for around $3-$5 for the entire sheet. » Tell me… What are your sewing tricks, tips and secrets? Please share! I love your idea to use old bedsheets! That’s so smart. Found your site via One Pretty Thing. I’m anxious to see more info on sewing. 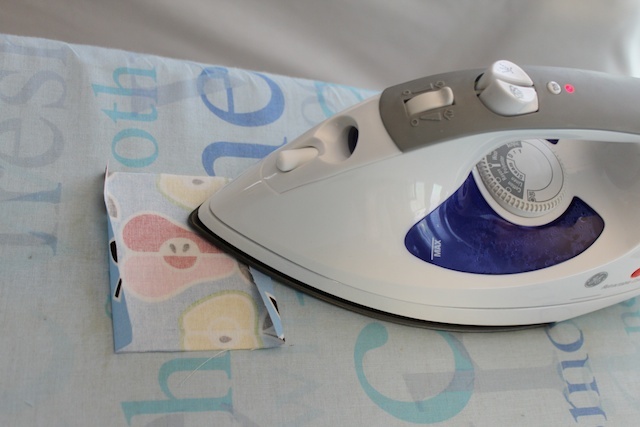 I’m a beginner with a hand-me-down sewing machine (yes, I’ve read the manual!). I’ve tried a few things but it’s following a pattern, getting things to line up, deciphering the instructions, and doing round corners (like arm holes) that confuse me. I’m going to practice getting a straight cut on my fabric…I’ve always wondered how you get a straight edge to begin with. Thanks for the tearing tip; that’s a great time saver! It can be so frustrating to try to get a straight edge, even with a rotary cutter and ruler. My favorite sewing tip comes from my mother-in-law. “Sewing is not supposed to be perfect!” Just enjoy it and don’t be too uptight about it. It is so fulfilling when you make something useful or beautiful with your own hands. Gee, my tip was to put down the wine glass. Seriously… sewing is one place where I shouldn’t “relax” first. Thanks for some great tips!!! I hope to improve immeasurably. Mostly because I can only go UP. I prefer older, (solid metal parts/good weight) machines. Most newer ones are so light, I’m afraid I’ll break something. If they break, total waste of money! At favorite thrift store, bought a vintage White 951 ($25 cdn). 25 stitches/4 step buttonhole. Absolutely mint condition, except for foot pedal cord (mouse chewed.) I wrapped the cord in electrical tape, and covered that with duct tape. Beautiful machine! I found a metal 6 cup, coffee stand. I was going to use it in my kitchen, but recycled it for my sewing. It holds serging/sewing thread cones. I simply turn it to the cone color (facing my machine) and thread my machine normally. Keeps thread out of the way/thread comes off the cone evenly.